According to U-Haul, the number of incoming truck rentals accounted for 50.3 percent of all one-way traffic into Texas last year. The report noted that year-over-year arrivals of one-way truck rentals into the state only rose by one percent while departures climbed three percent compared to 2016’s data. U-Haul attributed some of 2017’s outbound flow to Hurricane Harvey, which pounded the Houston area and the Texas Gulf Coast. Despite these minor fluctuations, Texas remained the nation’s top net-gain state, as it also was in 2016. Breitbart Texas reported that, in 2016, inbound U-Haul truck rentals outpaced departures 50.8 percent to 49.2 percent largely because of relocations to Austin, named the number two U.S. growth city in the 50,000-plus population category. In 2017, U-Haul recorded the largest number of one-way truck rentals for people relocating to McKinney and Prosper, suburbs north of Dallas, and Kaufman, southeast of the Metroplex, plus College Station in the Texas Triangle, and Temple. Austin, Pflugerville, Midland, New Braunfels, and Irving also posted strong net gains. It comes as no surprise to Texans that many of these incoming one-way U-Haul trucks departed from California. From 2008 to 2014, the Golden State accounted for 15 percent, or 219, of the companies that moved their headquarters, expanded their operations, or opened regional hubs in business-friendly Texas. The trend continues and includes heavyweights like Toyota, Liberty Mutual, JP Morgan Chase, State Farm, Farmer Brothers, Raytheon, McKesson, Pegasus Foods, Jamba Juice, Kubota, Facebook, Google, Apple, Dropbox, and Oracle. Following Texas, the balance of U-Haul’s top five net-gain states are Florida, Arkansas, South Carolina, and Tennessee. Massachusetts, Michigan, Pennsylvania, and Illinois ranked in the bottom five, #46 through #49. California, at #50, had the largest net-loss. In 2016, the Golden State tumbled to #49 after placing fifth on U-Haul’s 2015 list of growth states. That year, Texas was #39. U-Haul determines growth states by calculating the net gain of one-way truck rentals entering a state versus those leaving. 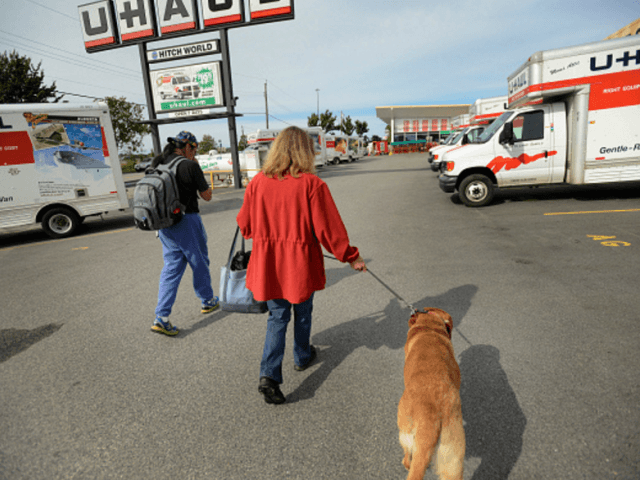 The company compiles migration trends data for more than 1.7 million one-way U-Haul truck rentals each year. They state that while migration trends do not correlate directly to population or economic growth, their growth data is an effective gauge of how well states and cities are attracting and maintaining residents. Interestingly, U-Haul’s migration trends mirror year-over-year findings from the U.S. Census Bureau. Breitbart Texas reported that between July 2014 and July 2015, census figures showed nearly 500,000 Americans relocated in Texas, more than in any other state. From July 2015 to 2016, Texas again led the nation, adding almost 433,000 new residents. In the July 2016 to 2017 cycle, Texas topped population growth figures by roughly 400,000, although, only slightly more than 79,000 reflected out-of-state transplants. In 2015, Texas Population Projections for 2010 to 2050 predicted the number of residents in the state could double by 2050 if current migration patterns continued at the same pace seen from 2000 to 2010. Using 2010 the population figure of 21.5 million, the Office of the State Demographer projected Texas would house more than 54.4 million, a mixture of births, immigration, and the number of people moving from other states. In 2017, the Texas population hit 28.3 million.